Just a quick note for you beer lovers out there seeking to be the next Beerdrinker of the Year. Your beer resumes need to be emailed into the Wynkoop no later than Thursday, December 31st. 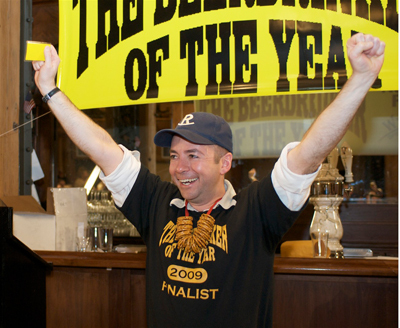 Your resume must include your beer philosophy, details on your passion for beer, and your 2009 beer experiences. It should "detail the entrant's understanding of beer and its history and importance to civilization, and the entrant's efforts to educate others to the joys of great beer." And all of this can not exceed three 8.5 x 11" pages in 12-point font. There are a few other rules, so make sure and check out the official Beerdrinker of the Year web site for all of the details. As an example, and to view the resume that got me into the finals, check out my 2009 resume. All of the beer resumes received by the Wynkoop are reviewed and thinned down to the top 10, at which point they are sent out to a panel of experts around the country to select the three finalists. Those lucky three will be flown to Denver for the finals on February 27th, 2010, at which time seven wigged & robed judges (of which I will be one) will ultimately select the winner. A good resume will take some work, so hopefully you've already started, or are touching up a previous year's application. (I submitted a resume in 1997 and 2005 before my 2009 resume got me to the finals.) If you are reading this blog you are surely a beer lover, and I encourage all of you to take a shot at the ultimate beer accolade!